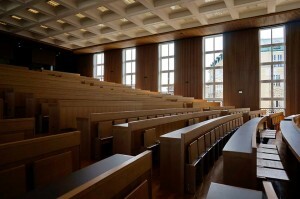 Hall 272 at Sofia University became “oddly” popular during the student occupation in autumn of 2013. 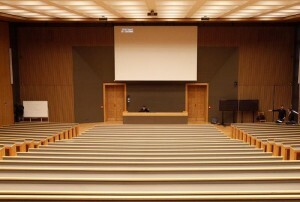 Actually, it is the largest lecture hall in Alma Mater, with a capacity of 715 seats. 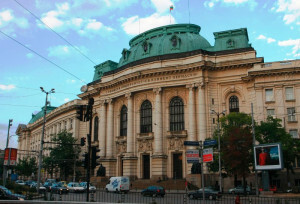 The student exams hold in it, the rectors select there and the future lawyers of Bulgaria prepare. 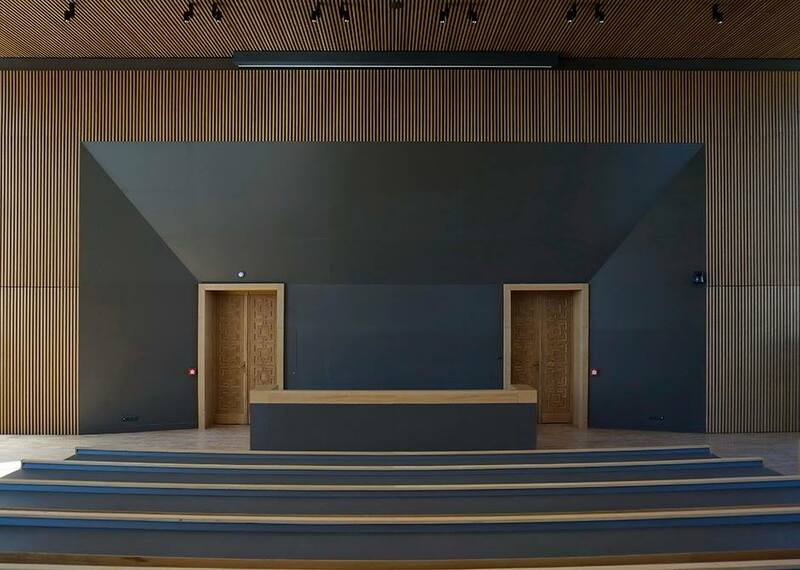 The complete reconstruction of the hall (architectural and technological) has been completed recently. Funding has been provided by the “120 years Faculty of Law at Sofia University – “St. Kliment Ohridski” foundation. The large-scale repair work was performed to celebrate the 120th anniversary of the faculty of Law. 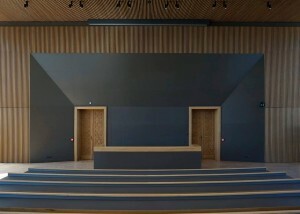 Technological modernization of the hall was connected with the replacement of air conditioning and ventilation equipment as well. “TANGRA” Ltd. had the task to produce and put into operation equipment for air conditioning and ventilation of the hall. Systems built after renovation of the hall include central air handling unit, air ducts, silencers, fire dampers, valves and many other items. Air handling unit TANGRA AHU DEX S manufactured and installed in the roof space above the hall 272, is with two-stage recovery of energy. The first part of the heat recovery is provided by a plate heat exchanger and the second by heat pump unit, thereby providing heating in winter, cooling in the summer and the supply of fresh air all year round. The amount of fresh air varies from 10 to 100 %, depending on the current load of the hall (number of students). The possibility of heating through the local station of the university is preserved, which allows selection of the energy carrier, depending on the current price. The air enters under the seats with sufficient low speed and ensures an even temperature field in the habitable zone of the hall. In booths for simultaneous translation is submitted fresh and conditioned air. Steps have been taken silencing the booths one another, and preventing the entry of noise from the hall. Mounted ventilation system provides fresh air to the students and lecturers. 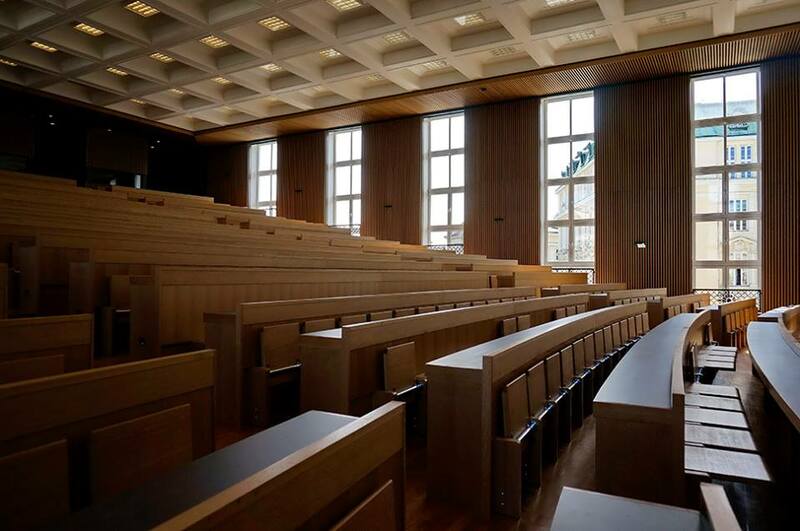 Many examinations prove the need for ventilation of such audiences, as in addition to increase of comfort, the delivery of fresh air for occupants helps better understanding of lectures and preservation of concentration. Last but not least, these types of systems help to reduce morbidity and allergies in students by filtering fresh air. 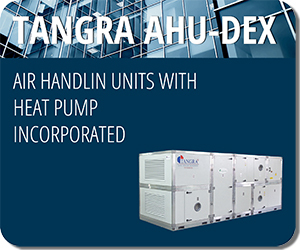 The air processing from the air handling unit TANGRA AHU DEX S is up to 20 000 m3/h., and with the consecutive two-stage heat recovery of exhaust air and the environment a very efficient use of energy is ensured. In winter days, with an average temperature of minus 30С, the air handling unit can produce 120 ÷ 150 kW/h heat at power consumption of 24 ÷ 30 kW only. Systems manufactured and installed by “TANGRA” are of the highest energy efficiency class. Part of the amount received by the company “TANGRA” implementing the Hall 272 was donated by Dipl. Eng. July Armianov, manager of the company, in order the hall to be completed. Thus, on 15.04.2015, on the eve of the Day of the Constitution and the lawyer, the largest lecture hall at Sofia University “St. Klimet Ohridski” was opened.